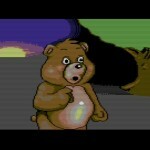 BooBer was to be a new C64 platformer game, where you would control a teddy bear main character. It was first started in 2011 by Andrew Bourhill of Apophis Games. 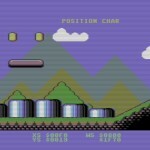 It was to be a two directional scrolling platformer – similar in style it seems to Mayhem in Monsterland. The basic story is that Boo has got lost in nursery land whilst on a picnic with his parents and you must help Boo return safely home. Of course nothing is ever so simple, Nursery land is also inhabited by some fairly evil nasties intent on harming Boo. 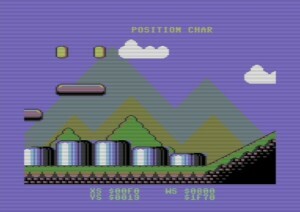 Over the weeks/months the game was in production, title screen, high score and disk loaders were complete. Music was produced by Joachim Wijnhoven as well. A traditional method of scrolling was chosen over VSP, and speed was achieved by using self modifying code. This was ditched and a $d011 scroll was used instead, where multi-directional scrolling was now possible. It sounded like the main character was controllable on the first level produced, and slope work was being carried out – then everything went dead. Joachim asked us to find out what had happened to Andrew, but there was nothing we could find online. Years passed, and then in early 2016 – Andrew resurfaced, with a new Flashback C64 conversion. BooBer it seems had sadly been lost in a disk crash, and then that coupled with real life – things were put on the back burner. 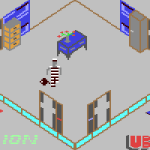 Now things have settled, Andrew hopes to get a proper conversion of Flashback sorted on the C64. As for BooBer – there is chance that something could be salvaged from the disk crash – but its looking unlikely, and now there are only screenshots to check out.